Remember, these are just my opinions, and if you have a special place in your heart for some of them, then by all means get them. After all, you'll be the one living in your home so you should make sure it is what you love. But if you wanted my two cents, there you have it. Okay, now that I've listed a few do's and don'ts, let me say that wall photo collages are one of my favorite things. "What? I thought you just said you hated them." No. I said I hate store bought ones, but ones that you create yourself using multiple frames are wonderful. I believe there is no better way to incorporate many varied pieces of art or photography. 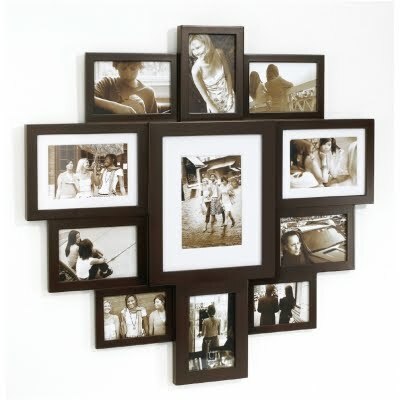 And because it is a collage, you don't have to worry about all of the pieces or frames matching. In fact, sometimes it's the differences that make it even more beautiful. And wall collages are not just for one certain type of style. If you love all things eclectic, this is for you. 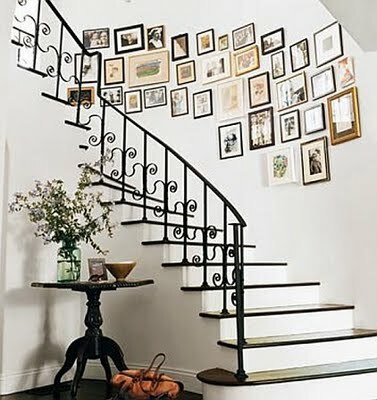 What better way to display all the artwork you've collected over the years? And what a statement it makes in the room. If a traditional style is more up your alley, it works for you too. 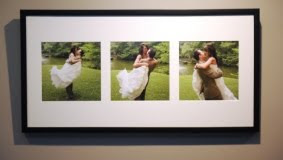 To convey a more traditional look, be sure to stick to a similar color pallet with your frames and artwork. Don't be afraid to vary the sizes of your pieces. This collage has pieces ranging from huge paintings to tiny frames. It's all in how you group them. Collages can take up a whole wall or just part of it. Both are sure to make a statement. If you're not sure of the arrangement you want, you can practice. 1. Lay all of your pieces out on a big piece of paper on the floor (butcher paper, the back of wrapping paper, etc). You may need to tape more than one piece together in order to fit all of your pieces. If you have a certain size area where you'd like to put your collage, say over a dresser, measure the area first and then cut the paper to size so you will be working in the exact amount of space you want to cover. 2. Move the pieces around on top of the paper until you have your desired look. 3. Trace the outline of the pieces onto the paper with a marker and set them aside. 4. Measure how far down and across each nail should be for the frame to hang where you want it and mark it on the piece of paper. 5. Tape the piece of paper where you want it on the wall and hammer in your nails at the markings indicated. 6. Remove the paper and hang your artwork! 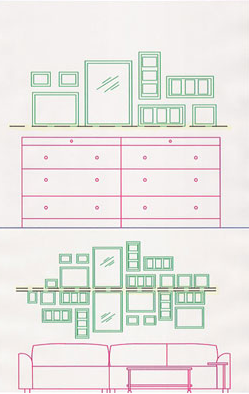 If you have a larger wall space to cover, then start with step 3 but instead of just tracing the frames, actually cut out the tracings of your frames. Put a piece of tape on them and move them around on the wall until you have a look you like. Then follow steps 4-6. If you're still hesitant about making the right arrangement and want a little direction, here are a few formations from Peggy at Design FormuLA. I think the most important thing to draw from them is that the pictures should either line up on the bottom (if you're having them over a flat streamlined surface) or have an invisible line of symmetry running through them in order to keep the look balanced. Also remember to keep similar spacing throughout. 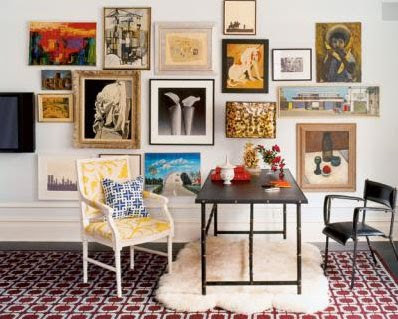 Hopefully, this will inspire you to dress up one of your bare walls.